Terahertz (THz) imaging emerged as a distinguish technique for material analysis and characterization in security, military, biomedical, pharmaceutical and aerospace sectors due to its significant capability in extracting the information of material thickness and density . Spatial resolution of THz imaging is strictly limited due to its long wavelength (100-1000um) lies between the infrared radiation and microwave radiation. Several near-field techniques have been successfully implemented to obtain subwavelength resolution in THz imaging, involving the subwavelength apertures, tips, or other spatial discrimination in raster scan on the sample to be imaged [2,3,4,5]. Further, Yuan et al. 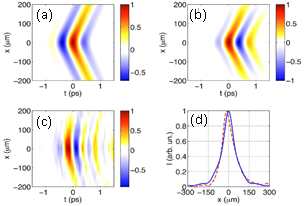 demonstrated that the signal-to-noise ratio (SNR) could be enhanced by generating a THz fieldspatially localized on deeply subwavelength dimensions exploiting the optical rectification from a focalized optical pump onto the nonlinear crystal , which can be an alternative approach for THz imaging scheme.However, a subwavelength beam profiling is still a subject of experimental and theoretical investigations. 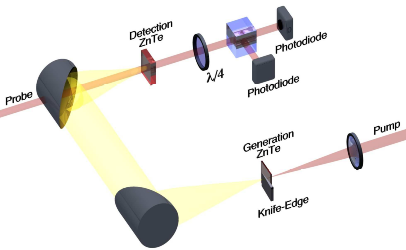 The spatial characteristics of a sub-wavelength THz source are not accessible using integrated knife-edge (KE) techniques due to the non-separable space-time nature of the radiated field and to systematic modifications induced by the blade itself. Fig. 1 Experimental setup for subwavelength-scaled terahertz generation and characterization. In our work, we show that the space-time coupling can be addressed and the source field profile can be exactly reconstructed by combining the KE with a time-resolved electro-optical sampling. A field-resolved spatiotemporal characterization technique has been investigated relying on the combination of KE and electro-optical sampling by exploiting the unique electric-field time-resolved capabilities offered by THz time-domain spectroscopy (TDS). Pulses of 800 nm, 100 fs, 5 nJ at 80 MHz repetition rae delivered by a Ti:sapphire ultrafast oscillator is tightly focused on a 20um-thick <110> ZnTe bonded on a 500um-thick <100> ZnTe substrate in order to generate THz radiation. The KE is performed via an aluminium blade directly attached to the surface of the generation crystal by translating the crystal laterally in micrometer scale. By taking the derivative of the measured time-resolved electric field along the blade coordinate, it is possible to retrieve the spatiotemporal profile of the source, showing an unexpected asymmetric field distribution along the spatial coordinate (Figure 2(b)). Fig. 2 (a) Electric field measured in the focus of the second off-axis parabolic mirror, as a function of the blade coordinate x0 and time; (b) electric field retrieved by means of spatial differentiation. An analytical model describing the relationship between the blade and subwavelength source has been developed in order to understand the physical origin of this asymmetry. We pointed out a systematic error affecting the field-resolved approach and, resorting to the exact Sommerfeld formulation of the scattering problem from an infinite, conducting half-plane, we provided a simple solution for retrieving the full spatiotemporal structure of the sampled field by introducing a transfer function (Figure 3). Fig. 3 Results from the data inversion taking account the transfer function; (a) simulated THz spatiotemporal field; (b) retrieved field obtained via KE + TDS under symmetry geometry hypothesis; (c) retrieved experimental field in the same conditions; (d) profile obtained with (solid) and without (dashed) considering the asymmetric KE transfer function. By exploiting the temporal electric field resolution associated to THz TDS, we theoretically, numerically and experimentally addressed the aberration issue and we provided a solution for retrieving the full spatiotemporal structure of the sampled field by introducing a transfer function. S. Hunsche, “THz near-field imaging,” Opt. Commun., vol. 150, no. 1-6, pp. 22-26 (1998). Q. Chen, Z. Jiang, G. X. Xu, and X. C. Zhang, “Near-field terahertz imaging with a dynamic aperture,” Opt. Lett., vol. 25, no.15, pp. 1122-1124 (2000). H. Bethe, “Theory of diffraction by small holes,” Phys. Rev., vol. 66, no. 7-8, pp. 163-182 (1944). F. J. Garcia-Vidal, T. W. Ebbesen, and L. Kuipers, “Light passing through subwavelength apertures,” Rev. Mod. Phys., vol. 82, no. 1, pp. 729-787 (2010). T. Yuan, J. Xu, and X. C. Zhang, “Development of terahertz wave microscopes,” Infrared Phys. Technol., vol. 45, no. 5-6, pp. 417-425 (2004).